Earn extra money each month by referring the SEO Management Team to the people in your network. Our affiliate program is simple, flexible and straightforward. There are no contracts, fees, monthly quotas or any added stress on your end. 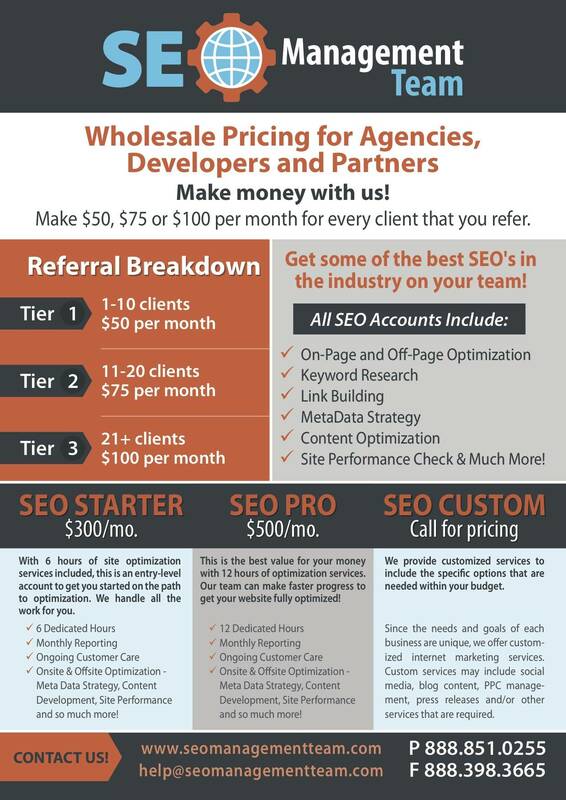 Simply refer the SEO Management Team and our SEO services to anyone in your network and earn $50-$100 EACH MONTH, PER CLIENT. You can utilize as little or as much of your network as you want. Even better, you don't have to worry about a thing because once you send them our way, we handle everything! All you have to do is sit back and count your money. Referrals will receive complete access to all of our SEO resources and services, ensuring that their site receives the attention it needs to boost its visibility online and increase sales. Check out the details below or call us at 888.851.0255 for more information. We look forward to working with you!